It will not be a great surprise if a young boxer from China will still be in a hospital in Kuala Lumpur, Malaysia when this article is finally posted. That will be days after he suffered a KO defeat at an undercard fight on the Manny Pacquiao versus Lucas Matthysee fight last Sunday, Malaysia Time at the Axiata Arena. Lu Bin is a 23 year-old fighter from Jinan, China. He had a great amateur career representing China. In 2012, he was the AIBA Youth World Boxing Champion, a title he won at Yerevan, Armenia. He won a bronze medal at 2013 Asian Amateur Championships in the light-flyweight division and represented China at the 2016 Summer Olympics, reaching the round of 16 before losing to Kenya’s Peter Mungai Warui. In 2017 Lu Bin turned professional. His first fight was against Wangchai Nianghansa of Thailand who is a veteran with a record of 9-10-0, 6KO. Lu Bin beat the Thai via a third round TKO at 2:41 of the round. The victory earned him the vacant World Boxing Council Asian Boxing Council Silver Light Flyweight Title. Buoyed by the victory, albeit against a boxer many will consider as a “tuktuk” driver, people handling Lu Bin decided to push him up many stops ahead, bypassing the traditional route boxers take on the way to title fights. Perhaps they were hoping Lu Bin would break the records set by Saensak Muangsurin or Vasyl Lomachenko who won world titles in their third professional fight. Lu Bin was fighting for a title on his 2nd pro fight! Speaking to many pundits and boxing purists, I learned that there is a reason why boxers traditionally start their pro careers with 4 round fights and gradually moving to 6 rounds, then 8 rounds, then 10 rounds before jumping to 12 rounds title fights. Fighters need to develop stamina, skills, street smarts and tolerance to pain as they fight opponents that gradually improve in skills, talents and strength. 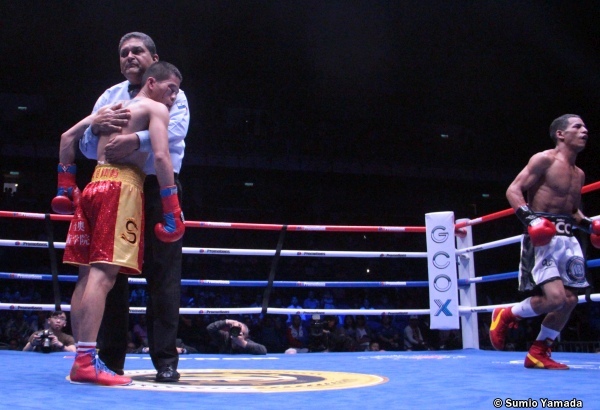 Referee Gustavo Padilla helps Lu Bin who was already out when the fight was stopped at 2:59 of the last round. Photo by Sumio Yamada. To this writer, with due apologies to his manager, the matchmaker and promoters, Lu Bin had no business being in a title fight against Carlos Canizares of Venezuela who holds a 20-0-1, 17 KOs record. Where they ill-advised? Perhaps. But in my opinion, their move was insane to say the least! Lu Bin in spite of his glowing amateur record was no match to Canizales. This writer was the cutman for Lu Bin and saw it up close and personal how he gradually gassed out as the fight gradually moved to the championship rounds. To his credit Lu Bin did not lose courage. The kid had a heart the size of China. But experience wise, he was miles away from center. As his cutman, I wish I had the authority to stop the fight. I would have done so, after round 9. But, who am I do so when his handlers were pushing him to continue? In hindsight, I should have spoken. But, again it was not my call. My prime duty was to manage injuries associated with cuts and bruises. That, modesty aside, I did very well, stopping bleeding from a cut on his right eyebrow area. Another huge issue was the fact that an English-Chinese translator was not available at the corner. I sensed that Lu Bin had a difficult time understanding trainer Buboy Fernandez who tried like hell to explain to him what he needs to do. Fernandez wanted him to box and run but the kid kept on coming forward making him an easy target for Canizales. 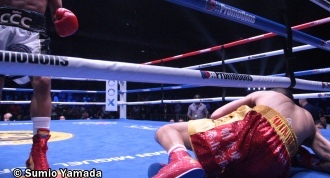 In the end, Lu Bin was kayoed in the 12th round. Lasting that long was a tribute to his fighting heart. When Lu Bin was brought back to his corner, he exhibited what I thought were symptoms of concussions. He looked like he was punched drunk and eventually collapsed. It was sad to watch the medical staff struggle to revive him. Adding to the struggle was the fact that the emergency first responders assigned to handle such tasks were very slow and seemed confused as to what exactly they need to do. Eventually they got Lu Bin to a hospital where he was checked out. Latest news from reliable sources received Wednesday July 18, Malaysia time, indicate that Lu Bin may need to stay another two days before being released to travel back home to China.